Pour 1/4 cup of oil in a roasting pan or dutch oven. Heat on the stove on medium. Rub the meat all over with the rub mixture. Place roast in the oil and brown on both sides. Heat oven to 400 degrees F. Place the dutch oven or roasting pan in the oven, uncovered. Roast for 1/2 hour, turn the roast over and lower the heat to 350 degrees F.
Roast for another 20 minutes or until the internal temperature reaches 130 degrees F. for rare, 145 degrees F. for medium, etc. Remove from the oven and allow it to rest for 15 minutes before carving. After the roast has been removed, place the roaster or dutch oven on top of the stove over medium heat. Add two cups of broth, stir to combine with the drippings. Simmer for 5 minutes. Pour through a strainer and serve warm with the meat. "We had this last Sunday for dinner and it turned out delicious. I roasted it at 400 degrees for 1/2 hour and then turned it down to 325 degrees F. It was moist and so flavorful. I will definitely keep this recipe to make again." "This was a great recipe. We ate it all up with some mashed potatoes. 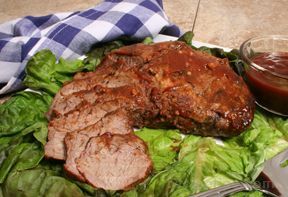 McCormick makes a barbecue seasoning that I used. It has brown sugar, tomato, garlic, onion, peppers and a slight smoke flavor." "I followed this recipe but cut back on the cooking time. I had the oven at 400 degrees for 15 minutes and then finished roasting at 350 degrees. Instead of roasting it for 20 minutes, I started checking the internal temperature every 10 minutes until it had reach 140 degrees because I was looking for a medium-rare roast. It turned out great!" "Savory, glad you tried the slow cooker method. This is the only way I fix a roast anymore because they come out so much more tender than roasting in the oven." "I made it in the slow cooker just like GrannyGrunt advised. It was tender and delicious. Granny's always know how to cook roasts best!" 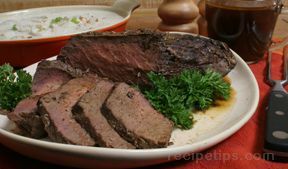 "I made some adjustments to this recipe and it turned out pretty good. I browned the roast & placed it in a slow cooker. Poured the excess oil out of the pan, added the broth and heated just enough to loosen the browned bits in the pan. Poured that over the roast, placed cover on slow cooker, and cooked for 6 hours on low. Strained the juices and served with the roast. I used a regular seasoning salt instead of the barbecue seasoning powder." "I agree with virgilthecook. After the 1st half hour some of mine was already med well! If you try this either don't brown it or subtract the browning time." "This is one of the worst recipes I have ever seen. First, if you follow the cooking times, you will get a shoe leather well, well, well, well done roast. You should at least cut cooking time in half, if not more. Second, who has ever heard of barbeque seasoning powder? What is it? What is in it?" "This is full of flavor! The pepper really stands out."